In a decade, Baba Ramdev’s Patanjali Ayurveda has become fast growing FMCG (fast-moving consumer goods) business whose net sales for the financial year 2015-16 stood at Rs 5,000 crore, is a household name now. But Baba Ramdev is only the face of the consumer products company. Balkrishna Suvedi, popularly known as Acharya Balkrishna who is supposed to be a close aide of the yoga guru, is the man behind the huge business success. With an ownership of 94 percent of the company’s stake, 43-year-old Acharya Balkrishna is now a billionaire who has entered the Hurun India Rich List 2016 as a billionaire with an astounding Rs 25,600 crore ($3.82 billion) under his belt. But, there are number of controversies associated with Balkrishna too – including those that question his Indian citizenship and academic qualifications. His high school degree – ‘Purv Madhyma’ and Sanskrit degree – ‘Shastri’ from Sampurna Nand Sanskrit University – do not allegedly exist on records. He was charged with cheating and criminal conspiracy for procuring fake degrees to acquire an Indian passport. He went into hiding, but was later arrested by the Central Bureau of Investigations (CBI) in 2012. The agency claimed that his passport was issued based on forged high school and graduation certificates and that he owned a pistol without a legal permit. Patanjali Ayurved Kendra Pvt. Ltd. had donated a sum of Rs 11,00,000 on March 8, 2009 to the Bharatiya Janata Party (BJP) – then in the Opposition – before 2009 general elections as donation. It was revealed in an RTI response given by the Election Commission. Born to Nepalese parents – Sumitra Devi and Jay Vallabh – who later migrated to India, Balkrishna met Ramdev at a gurukul in Haryana. They founded an ayurvedic pharmaceutical company named Divya Pharmacy in Haridwar in the 1990s. To cash in on the popularity and huge following of Ramdev worldwide, Balkrishna later helped set up a number of other businesses serving as the managing director in 34 of them. He heads three trusts associated with Ramdev and his Patanjali. Like an expert businessman, Balkrishna successfully understood the psyche of the Indian consumers and launched a campaign for swadeshi (indigenous) products, challenging the monopoly of FMCG majors in the Indian market. The promotion of the company and its products was started through Ramdev’s yoga camps and events as well as TV programs. 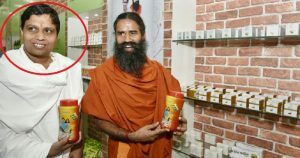 Notably, Ramdev does not hold a stake in the company. From conception and development to final packaging, Balkrishna remains involved with each product and it hits the market only after his go ahead. He insists on maintaining “quality” with a rural or rustic image of the company’s products. Balkrishna believes Patanjali has changed the consumer perception that Indian products are inferior to international products. Patanjali recently beat all established FMCG firms in the country. It even ate into the market share of players like Dabur, Baidyanath and Zandu that deal with herbal and ayurvedic products. The company has also entered into joint ventures with some foreign firms and has been exporting its products to countries like the Middle East, the United States and Canada to meet the projected turnover target of Rs 10,000 crore in the ongoing financial year (2016-17). Different from traditional CEOs, Balkrishna prefers to keep a low profile. His life-style differs vastly from his contemporaries. He wears traditional white kurta and dhoti and speaks Hindi. He does not use an iPhone. His work-station does not have a computer. He prefers to read from printouts stacked on his desk rather than online. He claims to work for 15 hours every day, even on Sundays and holidays. He – as he claims – has not taken a single leave so far.